Continuing on with my RO Revamps, I went and did a character window revamp. Combining the old Status window with the Equip window was one of the best changes to the game's UI that kRO did. It made complete sense since players depend on both stats and gear to improve their characters' performance. Instead of having to open 2 windows to adjust character stats, players can now open just one window to do so, freeing up more options for hotkeys. In this revamp, I took the update a step farther and merged the information altogether in a seamless window. 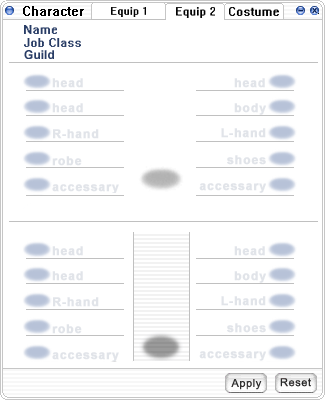 Mimicking the character window of modern MMORPGs, I took the Guild name information and put it up top and added space for character name and job class. I also added a slot for ammunition because I for one am tired of having to use a hotkey to equip and unequip ammunition items when I'd rather just take them on and off like any other equipment. I moved the cart inventory button off the character display in the center and put it off to the side (it'll be greyed out for any character that doesn't have the [Pushcart] skill). I also did the same for mounts and carts. I'm well aware that a future update of RO will split the window back into separate Status and Equip windows. Why on Midgard would kRO take a step backward in this regard? Who knows. They both still rely on one another for character performance so it makes no sense at all to split them back up. Edited by ZeroTigress, 20 February 2015 - 08:50 AM. 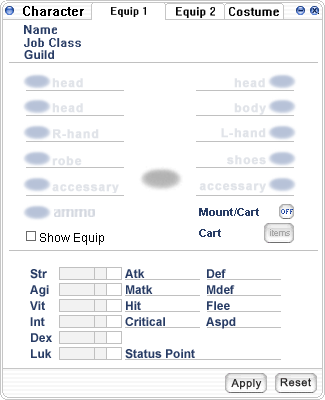 Rather than have it labelled "Equip 1" and "Equip 2", maybe label the tabs "Base" and "Shadow" to denote that one is the base equipment and the other is Shadow gear. Equip 2 encompasses both shadow gear and fake costumes (costumes with effects). Hence the separate costume tab for actual vanity costumes. Or it could be redone to be like Lord of the Rings Online's equipment system where you can set up different equipment sets on each tab and switch between them. I would love the Apply and Reset buttons at the very least because I'm sure there's plenty of people who mis-clicked while doing stats and had to waste money on neuralizers to undo a few points. Edited by ZeroTigress, 20 February 2015 - 07:50 AM. What about someone who uses a kafra shop mount and a cart? Or can you even do that? I don't think you need a separate shadow gear and costume tab since they're both technically the same thing. What about someone who uses a kafra shop mount and a cart? Or can you even do that? Think you might break RO as a whole if you could. I don't think you need a separate shadow gear and costume tab since they're both technically the same thing. Stat gear =/= costumes. "Costumes" with stats are technically stat gear. Costumes are meant to be for show, not for actual use with effects. This window is a compromise between the broken system that kRO came up with and the costume system that many of us were looking forward to. Equip 1 is for regular gear; Equip 2 is for shadow gear and stat "costumes"; and Costume is for actual vanity cover-ups (display only). Hey gaiz, I did a gear switch on my UI. Can I haz cheezburger?